The Duggan Steel Group, incorporating Duggan Steel (Irl) Ltd and Duggan Profiles & Steel Service Centre Ltd, was established in 1976. Operating from three factories in Kilkenny and a depot in Bandon, Co. Cork we supply steel construction components to both the Agricultural and Industrial sectors. Our aim is to provide excellent service and quality products at competitive prices. Duggan Steel (Irl) Ltd is the steel stockholding division of the Group. Its activities include the sale of structural steel sections and general steel products such as rebar, weld mesh and flow forge. A shot blasting and priming service is also available. 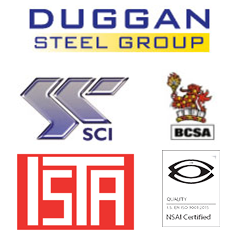 Duggan Profiles & Steel Service Centre Ltd is involved in the manufacture and supply of a wide range of steel building components including profiled steel sheeting, purlin and rail systems and a comprehensive range of associated ancillary products. Extensive range of structural steel sections and general steel products including weld mesh, flow forge and rebar. A shot blasting and priming service is also available along with nationwide delivery. Wide range of profiled steel sheeting for agricultural buildings including grant approved sinusoidal & box profile. We also supply clearlights and a complete range of flashings & gutters. Profiled steel sheeting and roof decking for single skin or built up industrial applications. We also supply liner sheeting, customised flashings, gutters, insulated gutters and clearlights. Our Steel Service Centre supplies a wide range of coils and flat sheets. These may be slit to suit customer requirements and supplied in bales or coil weights for convenient handling.